Place 3 agenda counters on Firmware Updates when you score it. Hosted agenda counter: Place 1 advancement token on a piece of ice that can be advanced. Use this ability only once per turn. I can't believe this card doesn't have any reviews yet! Firmware updates has the ability that Because We Built It should have always been, a free credit and a free click for advancing ice! Up until Order and Chaos, the meta was not sold on advanceable ice. 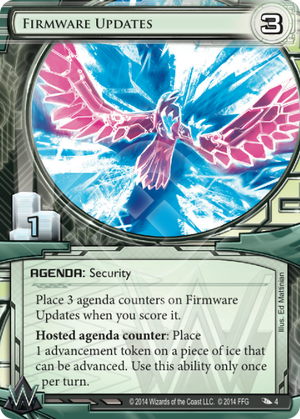 Is Firmware Updates the magic card that advanceable ice decks have always needed? ...not quite. Advanceable ice is still too slow, too finicky, and too much investment for not enough payback (play BWBI against Leela and see what I mean). • Give your Tyrant or Woodcutter a subroutine the first time they are rezzed! • Use Mark Yale in to get 11 all at once for no clicks (14 if you're Titan Transnational)! • Bluff a triple-advanced unrezzed ice as a Wormhole and watch them cry as you rez an Orion for a measly 3! • Get the BWBI experience with a non-trash ID! OK, OK, I get it, don't go all-in on advancable ice, and don't play Because We Built It. So what should I play? And how would Firmware updates help me? Titan decks should consider running this agenda for the Mark Yale synergy alone. Decks that like 1 point agendas, like Argus Security: Protection Guaranteed could see value here, especially if they are packing a Wormhole, Nebula, or Ice Wall. Try some shenanigans with Constellation Protocol or Trick of Light to return space ice to your hand as Blue Sun: Powering the Future. Firmware is good, and a step in the right direction for the advanceable ice archetype. It's not enough to save it single-handedly, but its a useful tool and a strong step in the right direction. Maybe we'll see a tier 1 advanceable ice deck in the future, and if we do, I expect that deck to be packing 3x of it. This card makes me really excited for the coming of Weyland Consortium: Builder of Nations in Flashpoint #2: Blood Money. Why? Because it essentially turns this agenda into House of Knives! This makes the prospect of constant pressure Weyland decks even more real and scary. What House of Knives doesn't do, though, is make your ICE better, cheaper, faster, stronger. Or let you save yourself from economic crash as advised by Mark Yale. You can advance your ICE at instant speed, so it might let you defend yourself even against unlikely odds. Say, advance your Wormhole thrice and use it to stop the runner for free? It's a helluva thing! After you spend all your counters, there is no loss in feeding it to Archers, Corporate Towns or whatever, since it's a 3/1. There's even a possibility of smart, janky fast-advance with any ICE and Trick of Light. Conclusion: this is your Swiss knife. Eat soup, open beer, gouge eyes out, all-in-one. Hugely underplayed, but I expect a huge comeback of this little thing very soon.